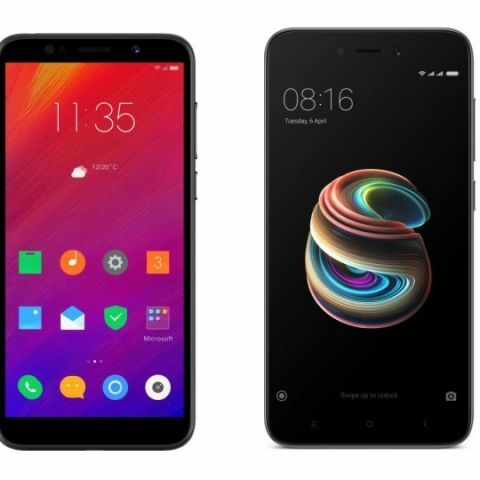 Today, we are comparing two of the most budget-friendly smartphones Lenovo A5 with the Xiaomi’s Redmi 5A to see which one packs a solid hardware under an affordable price. The Lenovo A5 is recently launched in India with a price tag of Rs 5,999. The price that will not burn a hole in anyone’s pocket. However, it is not the only smartphone in the market that comes at this much affordable price. The Xiaomi Redmi 5A is also a quite popular smartphone in this segment. So, if you’re confused and not able to decide which one gives the best value for your money, then here is the specification comparison between the two that will give you a better insight. Let's begin with the comparison of these two devices in detail. The Lenovo A5 comes with a bigger 5.45-inch display than the Xiaomi Redmi 5A, which sports a 5.0-inch display. The Lenovo 5A also offers a slightly better resolution than the Xiaomi Redmi 5A as you can see above in the table. With that, the Lenovo 5A would be more preferable for those who usually spend their time watching movies and TV shows on their smartphone. When it comes to the processor, the Lenovo A5 is powered by a MediaTek 6739 processor, while the Xiaomi Redmi 5A comes with a Qualcomm Snapdragon 425 octa-core processor. Let’s talk about the cameras, both Lenovo A5 and the Xiaomi Redmi 5A have a 13MP rear camera. However, if you love to take selfies then the Lenovo 5A has an 8MP unit on the front in comparison to the Redmi 5A that has a 5MP front camera. The Lenovo A5 looks better when it comes to the front camera at least on paper. The Lenovo A5 is expected to go on sale soon on Flipkart at a price of Rs 5,999. On the other hand, the Xiaomi Redmi 5A can be purchased at Rs 5,999.